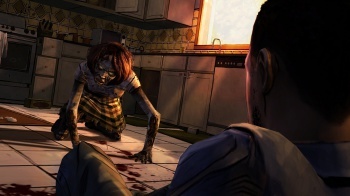 Telltale's planning on getting Episodes 4 and 5 of its zombie adventure out by December. If you're a fan of Telltale's Walking Dead adaptation, there's one thing that's guaranteed to frustrate you: release dates. Telltale's coy 'coming soon' placeholder is often the only thing gamers see on the official site when they go looking for news. However a chance Twitter question has revealed perhaps a little more than Telltale had intended: a December release date for a physical disc collection of the game. "Entire season on disc Dec 4th in [North America] for Xbox 360 and PS3," Telltale Tweeted. So Episode 4: Around Every Corner and Episode 5: No Time Left will presumably get download release before then. October and November, maybe? European gamers don't have the consolation of a firm release date for the collected edition, alas. Incidentally, for those iOS users who, like me, might be feeling a little unloved, Telltale had this to say on its Twitter feed: "We are also very close to release for [Walking Dead] Ep3 on iOS and will have a date very soon." I'll be sitting over in the corner holding my breath. Should I turn blue, you know what's gone wrong.